Magic Plant aged pepper mash is made of freshly harvested chilies/capsicum fruits. Then we age it to perfection. Our premium pepper mashes are specialized, labor intensive products. We provide gourmet, homemade tasting mash. But we produce it on a large scale. Our Pepper mashes are available as single pepper products. We also provide products that use a mixture of several pepper types. Additionally, we customize mashes. We prepare products by adding vinegar, citric acid, and salts according to the specifications of our customers. Presently, those in the food industry focus on providing foods using all-natural ingredients. This includes hot sauce manufacturers, co-packers, and restaurants. All-natural, wholesome foods are a focus globally. Ultimately, we agree it’s important to serve foods containing all-natural ingredients. Therefore, we package our mash using all-natural ingredients. We also use natural processes. This is because we understand the need for healthy alternatives. Ultimately, our goal is to provide all-natural products to all our customers. We provide naturally wholesome products for industrial use. This includes using it as a base ingredient for industrially packaged hot sauce. Also, other food manufacturers use the mash in their recipes. Restaurants also provide this natural condiment served on the side. And they use in their recipes. Magic Plant Farms produces premium Pepper products. Magic Plant Farms mash is available in bulk packaging: 5-2275 gallons. And it is available ready for retail in 9 ounce jars. We also offer private label pepper mash products. Our unprocessed mashes are free of GMO, MSG, and Allergens. They contain capsicums, vinegar, citric acid and salt. Mash products will last 24 months under proper storage conditions. Store mashes in a cool, dry place not to exceed 75 F. Avoid direct sunlight exposure. People may refer to mash by a number of other names. Some call it fermented hot sauce or fermented pepper mash. Additionally, it may be called puree, pepper paste or cooked pepper mash. Similarly, some call it unprocessed pepper sauce or unprocessed pepper mash. Some just call it cooked pepper mash. Meanwhile, others refer to it as a base. They may call it hot sauce base. Another group of people may refer to it as vinegar-, salt- or aged pepper mash. Ultimately all these names refer to the same product. Our naturally fermented mash begins with coarsely ground fresh peppers and salt. Then, time-consuming all natural fermentation process occurs. This natural process promotes the development of its complex flavors and aromas. A slightly chunky texture is typical of this kind of product. First, fresh Capsicum fruits and salt are combined in a drum. Then they ferment and age over a period of months. Finally, it develops into a delicious tasting pepper mash. As a matter of fact, some say the taste is addictive! Industrial food companies and hot sauce makers use pepper mash as a base ingredient. It provides a base for a variety of sauce products. For instance, it makes a flavorful hot sauce, barbeque sauce, wing sauce or salsa. It is often used in different tomato sauces. Additionally, it is used in many other food products. It may be added to chili beans, salsa, soups, marinades for example. Please note: Raw pepper mash requires further processing and cooking before consuming. Our mash products are pasteurized using gourmet vinegars and salts. This preserves the natural, aromatic pepper flavor. ‎Ultimately, this provides you a great base for making delicious hot sauces and a variety of other tasty dishes. It can also be added any of your foods. Add some to stir fries, fish, soups, eggs, steak, chicken, and more. Magic Plant Pepper Mash is a ”Hot Sauce Starter. ” Of course you can use our pepper mash with any hot sauce recipe. Simply add ingredients like garlic, onion, shallots, vinegar, or carrots. In fact, use it as a base for making your own signature custom hot sauce. Disclaimer: WARNING! The unpasteurized bulk product has not been pasteurized or cooked. Therefore it may contain harmful bacteria that can cause serious illness. This risk is heightened in children, the elderly, and persons with weakened immune systems. Although the risk of contamination with harmful bacteria is very low, it still exists. The mash products naturally ferment with good lactobacilli. The lactobacilli cause the peppers to establish a PH level of around 3.4 when fully fermented. This product acidifies naturally. Botulinium and Salmonella cannot live at this low PH level. Occasionally, harmless molds and yeasts appear on the top of the product in the barrel. This occurs if the product is exposed to air for a period of time. It can be scraped off with no loss of product quality. Choose the ingredients you want. Start with our aged, fermented pepper mash. Then add the type of vinegar you prefer. For example, you may add apple cider vinegar, distilled white vinegar, rice wine vinegar, or red wine vinegar. Each vinegar changes the flavor profile. First, we start with freshly harvested habanero chili peppers. Then, we age them to perfection. Finally, the end result is an aged habanero puree. Use it as a base for making hot sauces. Or use it to add a gentle kick to your favorite soups or stews. 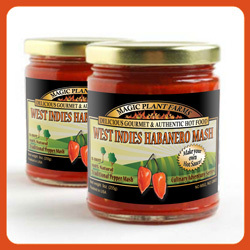 Habanero mash products are available ready for retail, or for wholesale. Buy the Habanero Mash here. At Magic Plant, we first start with freshly harvested Moruga Scorpion peppers. Then, we age them to perfection and allow them to ferment naturally. Finally, we bottle our Moruga mash and get it ready for both retail and wholesale markets. Ultimately, the final product is perfect for making your own personal hot sauce. Additionally, drums containing the mash are shipped to providers in the food industry. Moruga pepper puree is useful for making a variety of hot sauce products on an industrial level. Use Moruga Scorpion mash sparingly until you discover your level of heat tolerance. It can pack a little punch. But the flavor is out of this world! Buy Moruga Scorpion Mash retail and wholesale. Magic Plant’s Carolina Reaper Pepper Mash starts with the hottest pepper in the world! First of all, we harvest Carolina Reaper chili peppers fresh. Secondly, we allow them to age. Thirdly, we use the perfectly aged reaper peppers to create a tasty mash. And finally, we bottle the Reaper mash for retail and wholesale markets. Make no mistake, this mash is HOT! But, it is tasty too. Use the mash sparingly as a little heat goes a long way. Add it to your signature hot sauces. Additionally, it can also be used in stews, soups or casseroles. Small amounts in your sauces can give them a kick! Industrial users incorporate the mash into a variety of hot sauces and recipes. Of course, to the delight of their customers! Buy Carolina Reaper Mash retail and wholesale. Magic Plant makes its Aji Amarillo Pepper Mash from freshly harvested chilies. After we harvest them, then we let them age. The Aji Amarillo pepper adds a fruity flavor to the mash. But provides a kick at the end. The Amarillo ranks in the mid-hot range in SHUs. This provides mash with just enough heat and a lot of flavor. Finally, this flavorful mash can be purchased ready for retail. Or it can be used in industrial settings and purchased in large drums. Buy Aji Amarillo Mash retail and wholesale. First, Magic Plant starts with freshly harvested Aji Panca chili peppers. Then, we age them to perfection so we can use them for our pepper mash. The Aji Panca mash, like the pepper, is hot, but not fiery. It’s rich, yet fruity flavor forms a nice combination in a mash. The final product shares a nice, distinctive flavor like berries. But it also has a subtle smoky quality that adds the perfect touch. As a result, the Aji Panca puree, or mash, is perfect for a meat rub. It adds a wonderful flavor to a roast or a kebab. Purchase Aji Panca mash packaged for retail, or in industrial sized drums. 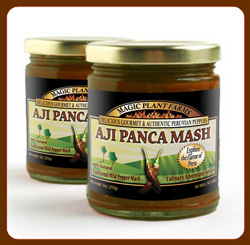 Buy Aji Panca Mash retail and wholesale. Freshly harvested Aji Rocoto chili peppers form the base for Magic Plant’s pepper mash. One of the oldest peppers brings a distinct flavor to each dish. The light but fruity flavor of the Aji Rocoto yields a delightful mash. Use it for your own salsa. Or add it to soups, sauces, and pastes. Since it is not quite as hot as some of the other pepper mashes, some prefer to add it as a condiment. As a result of the pepper’s thick walls, the mash has a thicker consistency. Contact us regarding this item.